As well as a martial arts supremo and horse-riding-while-bare-chested extraordinaire, Vladimir Putin has added another string to his bow. The Russian leader has now proved himself pretty handy with a sniper rifle, as he tested out a new weapon at the Patriot park in Moscow. 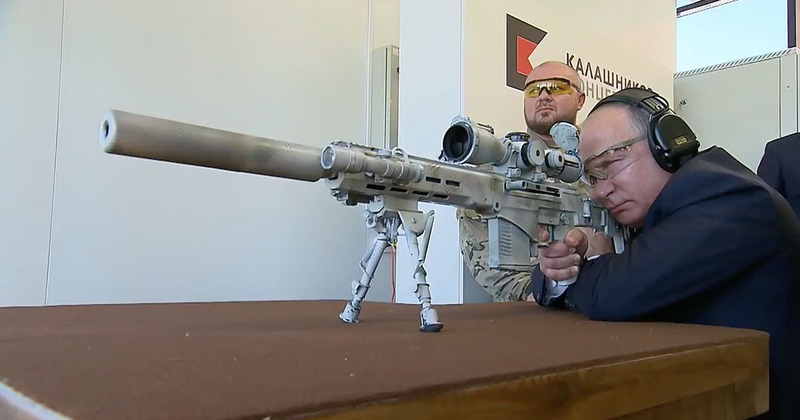 Lining up with a Kalashnikov-designed, Chukavin sniper rifle, known as the SVCh-308, Putin took five shots at a static target at a distance of 1,968 feet. Three of his five shots were accurate enough to kill, apparently hitting the head, liver and abdomen of the target. The other two shots missed. The footage shows Putin sitting at a table on a rifle range in his suit and tie, with ear defenders and safety goggles on, taking aim with the deadly weapon. The video comes just days after Russia was linked yet again to events in Salisbury. On Sunday, September 16, Alex King, 42, and his wife, Anna Shapiro, 30, were taken to hospital after they claimed they had been poisoned by the Russian state in a restaurant. However, according to police sources, the latest incident may be investigated as a ‘hoax’. Mr King is a convicted criminal and once hoaxed Prince Charles, according to BBC. Wiltshire police have since confirmed the couple were not exposed to any nerve agent, and authorities are not linking the incident with the recent poisonings in the city. However, given the events in Salisbury earlier this year, a full investigation is underway. Both Mr King and Ms. Shapiro were, however, discharged from hospital after testing negative for any poisons. Back in March this year, Russian ex-spy Sergei Skripal and his daughter Yulia were hospitalised after collapsing outside a restaurant in Salisbury after being exposed to the nerve agent Novichok. Both Sergei and Yulia survived after weeks in hospital. However, in June, two residents fell ill after being exposed to the same nerve agent. Sadly, 44-year-old Dawn Sturgess died as a result. The UK government has recently accused two Russian men, filmed on CCTV in Salisbury at the time of the suspected attack, of trying to kill the Skripals. However, in an interview on a Russian state-run news channel, the men – Alexander Petrov and Ruslan Boshirov – claimed they were tourists in the city, and denied any involvement in the incident.